LONDON, ENGLAND–Tottenham Hotspur Stadium in north London is poised for its inaugural night match on Wednesday, April 3, which will showcase an LED lighting system highly customized to create a one-of-a-kind experience for players, spectators, and fans watching around the world. 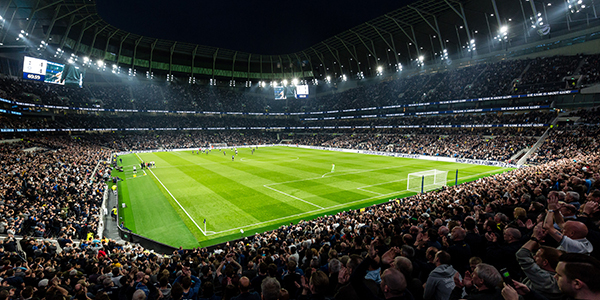 The system was designed by Musco—Tottenham’s Official Stadium Field of Play Lighting Supplier—and features the company’s industry-leading Total Light Control—TLC for LED technology. Virtually all aspects of the LED system have been custom designed and fabricated to create a site-specific solution to match the unique features of the state-of-the-art venue. Luminaires and cross arms were built to meet the exact specifications at each location, and supporting electronics were remotely mounted in dedicated electrical rooms. Custom controls for the field-of-play lighting integrate with other architectural and feature lighting to create cutting-edge light shows and a truly unique entertainment experience. With Musco’s long-term parts and labor warranty and performance guarantee, Tottenham Hotspur won’t have to pay for any maintenance to the system well into the future. Since 1976, Musco has specialized in the design and manufacture of sports and large-area lighting with innovations in light quality, glare reduction, and light control responsible to the needs of facility owners, users, neighbors, and the night sky. Musco’s TLC for LED™ system technology delivers a level of light control and uniformity that can’t be matched, and is the solution of choice for neighborhood fields, collegiate and professional stadiums and arenas, international speedways, and global events such as the Olympic Games. Musco backs its LED solutions with a long-term warranty covering parts and labor, eliminating maintenance concerns and costs for its customers.